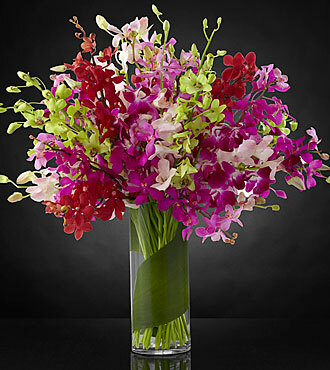 A mix of South Asian mokara and dendrobium orchids often come to mind when one thinks of natural beauty. These brightly saturated colours mix beautifully in this bright mix of silk-like hues. These opulent blooms arrive in a tall statement vase and are accented with lush green foliage to delight the eye and make each bloom pop. This luxury vased arrangement is a gift that will surely touch their heart. This deluxe gift is large enough to grace their dining room table.